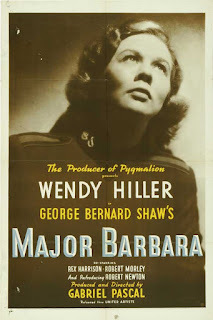 This is the second time I’ve written about George Bernard Shaw’s work, Major Barbara. The first time, I was taking the Advanced Placement exam in my senior year of high school. The assignment was to write an essay on a literary work, and I figured that by the time the graders had read their thousandth paper on 1984, they’d be relieved to read about something different. And since I knew of no school that assigned Major Barbara as a part of the curriculum, they might grade it well. It worked. But that was an essay based on the play which I'd read. This post is about the film I watched. The play made its debut in 1905 and was published with a preface by Shaw in 1907. 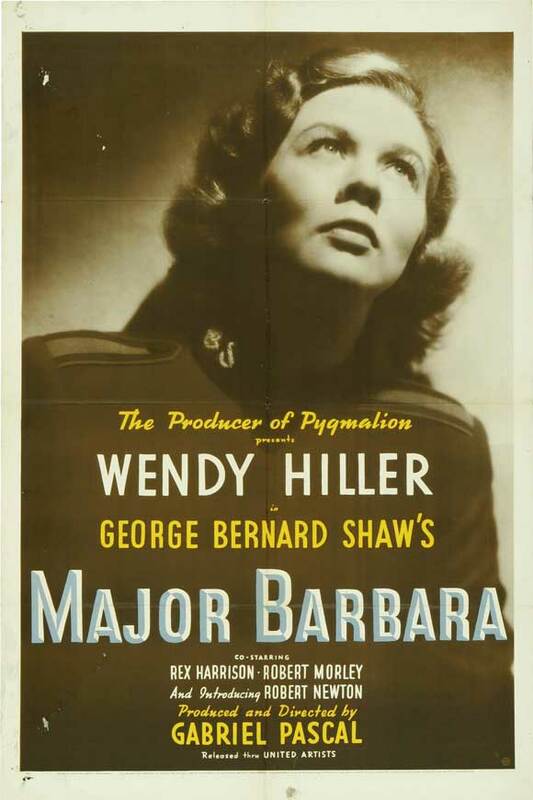 The movie was released in 1941, and though Shaw is not credited with the adaptation (as he was in the film version of Pygmalion which came out three years earlier), it is quite faithful to the original work. But her allegiance to the Army is strained when the organization accepts money from her father, arms manufacturer Andrew Undershaft. She was convinced the Army would not take such filthy lucre, but she is proved wrong. The Army also takes money from Bodger, a whiskey manufacturer. This is too much for Barbara; she leaves the Army. Now whether a church or parachurch organization (and the Salvation Army** is an interesting combination of a church and a charity) should take "tainted" money is an interesting question. I know that when my brother was raising support as a missionary, he didn’t want to take money from people who weren’t Christians, since they wouldn’t be able to understand and support his ministry of sharing the Gospel. There have been a number of interesting legal situations in which churches have taken illegally obtained funds and were required to return financial gifts. But is it really possible for a large organization to know where funds come from or how they were obtained? Though Barbara seems quite self-righteously certain that it’s wrong to take money obtained by making weapons and alcohol, not everyone shares that view. After all, Jesus was a manufacturer of alcohol at the wedding in John 2 (and no, I don’t buy the view that was just grape juice). Why is Barbara so surprised that an organization called the Salvation ARMY is not offended by an arms manufacturer? There are other things about the Salvation Army, as presented in the play and film, that bother me much more than taking gifts from disreputable sources*. For instance, early in the story, Adolphus Cusins (a philosopher, played by Rex Harrison, who would later play Henry Higgins in My Fair Lady), attends a meeting and claims to be converted. But he soon freely admits he first converted to “your religion” when he was five and had since “swallowed twenty other religions whole.” Despite this rather startling admission, Barbara recruits Adolphus into the Salvation Army Band and, not long after that, becomes engaged to marry him. 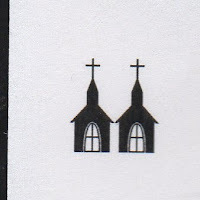 Both of these things would concern me -- a church leader should be concerned about marrying someone who considers Christianity just one object in a collection of religions. I also was not impressed with how the mission in the film cares for the poor. Apparently, several con artists hang about the place, avoiding work and taking free food and shelter. 2 Thessalonians 3:10 makes it clear that those who choose not to work should not eat. But most disturbing is the way a certain thug by the name of Bill is treated. Bill’s wife leaves him to join the Army and becomes romantically entangled to Major Todger Fairmile, a former champion boxer and wrestler. (Todger preaches, “The ring and prize money was too small compared to what God had to offer. Can you go eternity with the devil in the ring for no money at all?”) Bill tries to pick a fight with Todger and spits in his face. Todger resists striking Bill, which is commendable. But then, in front of a crowd, Todger forces Bill to his knees and brings his hands together as if he was praying. That doesn’t show a very high regard for free will. On the other hand, the Salvation Army in the film does display a sign that reads, “He loves me with an everlasting love” and a picture of Jesus with the words, “The blood of Jesus, God’s Son, cleanseth us.” Though we don’t hear Barbara talk about Jesus, the Army apparently does. After Barbara leaves the Army, she adopts a philosophy closer to Shaw’s, saying she no longer is “offering the bribe of heaven” but will “lift man to God.” The Army continues to offer the promise of heaven and God’s stooping to save us. 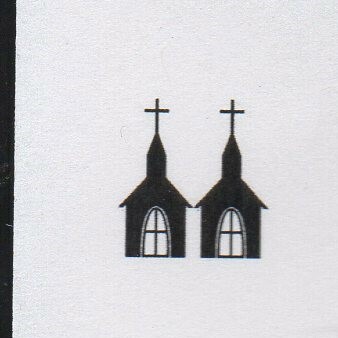 So the Salvation Army in this film receives just Two Steeples (because it doesn’t live up to the Salvation Army of the real world. The real Salvation Army would surely earn four). **You may have noticed that this is our second movie this month about a woman serving in the Salvation Army. Women in leadership have been a part of the Army since its beginning.